With the mountains on one side and the ocean on the other, Santa Barbara is truly paradise. Always sunny and 75 degrees, what else could you ask for? Just when it seems like it couldn’t get any better, you find out there are tons of vegan options in Santa Barbara and you’ve decided to cancel your flight home and stay for good! Whether you are just vacationing in the Santa Barbara area, moved there for school, or are a local, you will for sure want to check out some of our top recommendations for vegan dining in the area. 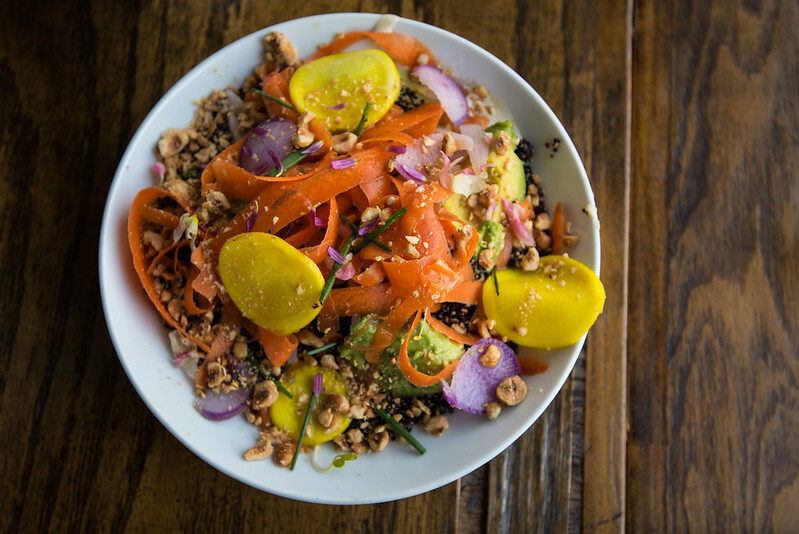 We’ve made a list of 15 places that offer delicious plant-based options, to make your dining experience top notch while exploring the Santa Barbara area. Mesa Verde is a vegetarian, gluten-free, and all organic restaurant located on the mesa in Santa Barbara. From brunch to dessert, there is something for everyone to enjoy at this plant-based eatery. Head over for brunch on Saturday or Sunday mornings, and try the macro bowl, tempeh bacon, avocado, pickled cabbage, and grilled kale. Yum! They offer fancy, one of a kind entrées, too, like the pulled smoked mushroom. This Southern-Style Pulled Mushroom Sandwich is a great alternative if you want to cook something similar at home. This lovely restaurant is open seven days a week until 9:00 PM, and is located at 1919 Cliff Dr, Santa Barbara, CA 93109. Another must is Natural Cafe, which has two locations in Santa Barbara. One location is conveniently downtown, while the other is right off of Hitchcock Way. Natural Cafe offers many vegans options, which makes it a popular place among plant-eaters on State Street! Feel free to indulge in sandwiches like the falafel pita, which takes delicious falafel in a whole wheat pita, and piles on hummus, tomato, sprouts, and shredded carrots. You could also try a refreshing smoothie, like the Aloha Bra smoothie, which has pineapple, banana, and pineapple-coconut juice all blended up. Not in Santa Barbara? Try making this Tropical Raspberry Kiwi Smoothie at home instead! Natural Cafe has two locations in Santa Barbara. One is at 361 Hitchcock Way, Santa Barbara, CA 93105, and the other one is located downtown, at 508 State St, Santa Barbara, CA 93101. If you love açai bowls, be sure to hit up Backyard Bowls. 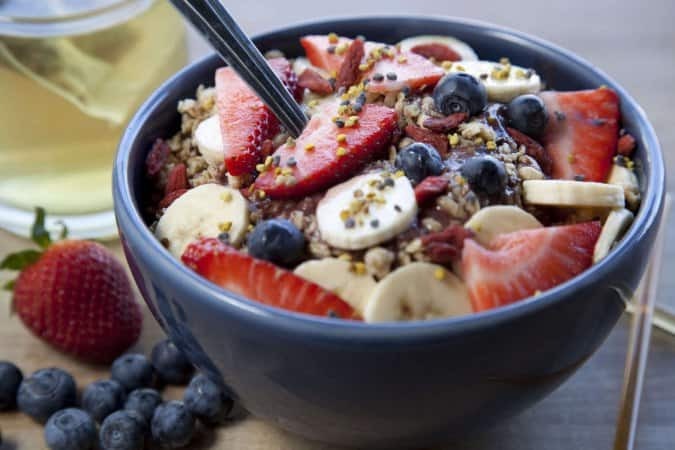 Porridges and smoothies are also offered at this lovely, fast paced, eatery, but the açai bowls are the most popular item on the menu by far. Try the island bowl, which uses açai , banana, mango, pineapple juice, and coconut milk as the base, and piles on banana, strawberry, blueberry, coconut shavings, granola, and honey (make sure to omit the honey and ask to add agave instead!) If you are in the mood for something different, try the PB&J quinoa, which consists of quinoa, cashew milk, peanut butter, bananas, and local berry jam. This delicious combination will keep you full until lunch! Not planning a trip to California anytime soon? Try making this quick and easy 3-Minute Acai Bowl. Backyard Bowls is located at 331 Motor Way, Santa Barbara, CA 93101, as well as 3849 State St, Santa Barbara, CA 93105. Saigon is located at 1230A State St, Santa Barbara, CA 93101 and 3987 State St, Santa Barbara, CA 93105. If curry and masala are more your thing, you will want to visit Flavors of India, which has been voted the best Indian food in Santa Barbara for the last 25 years. It is not a vegetarian or vegan restaurant, but they have many options to choose from, and they even have a vegan menu! Also, every dish on the menu can be made mild, medium, or hot, for those who are looking for a fiery kick! They also have a lunch buffet Monday through Saturday, from 11:00 AM until 3:00 PM, for those who want to try a little bit of everything. If you go for dinner, try ordering the vegetable pakoras as an appetizer, and yellow daal as your entree. If you prefer to cook at home, try out this recipe for Baked Vegetable Pakoras. You can find Flavor’s of India at 3026 State St, Santa Barbara, CA 93105. Oliver’s is an all vegetarian and vegan restaurant, located in Montecito, which is the next town over from Santa Barbara. Oliver’s is a fine dining restaurant and is serving up all different types of plant-based fare that is minimally processed. Many different entrées are offered, like the grilled cauliflower steak butternut squash ravioli, and the toasted farro risotto. There are couches for a more relaxed feel, and outdoor seating, as well. Interested in cooking up a similar dish at home? Try making these Crispy Cauliflower Steaks! Oliver’s is located at 1198 Coast Village Rd, Santa Barbara, CA 93108. Visit Green Table on West De La Guerra Street, if you are looking for healthy plant-based fare that will leave you feeling like a superhero. Everything is local, organic, and gluten-free, and most of the menu can be made vegan. They also have the largest selection of matcha blends in California. One matcha blend house favorite is the green table matcha, which has a rich chocolate caramel flavor and is blended with extra matcha and energy, with a hint of pink Himalayan sea salt. If you want something more filling, go for the vegan veggie parm or the roasted red pepper. There is a pretty extensive dessert menu too, which we are definitely not complaining about! Try the raw fudge, which is made with raw cacao, coconut, sprouted walnuts, vanilla bean, dates and cacao nibs. You could also try making your own fudge with this recipe for Quick and Easy Raw Chocolate Fudge. Green Table is located at 113 W De La Guerra St, Santa Barbara, CA 93101. It is always a yes when it comes to pizza, and Pizza Guru is satisfying all pizza cravings! Not only are there a plethora of vegetables available, but they also offer Daiya, a popular brand of vegan cheese. A variety of vegan meats are offered as well, like vegan pepperoni and vegan bacon. They have a vegan garlic white sauce that is a hit among herbivores and omnivores alike. Almost everything on the menu can be made vegan, which means there are plenty of delicious pizzas to choose from! If you are cooking at home, try making this Thin Crust Jalapeño Pizza. Pizza Guru is located at 3435 State Street, Santa Barbara, CA 93105. The Savoy Cafe and Deli is a popular eatery among tourists and Santa Barbara locals, and was even featured on the food network. There are many vegan options to choose from, as well as a pet friendly patio so your fur-babies can join you for a lunch date. Try the organic tofu stir fry or the veggie wrap, which is filled with portabella house made hummus, organic spinach tossed in olive oil and lemon juice, avocado and red bell pepper. They also offer vegan deserts like lemon poppy seed cake and carrot cake. Yum! If you can’t make it to Savoy Cafe and Deli but are craving something sweet, try making this Raw Carrot Cake With Cashew Cream Cheese Frosting instead! Savoy Cafe and Deli can be found at 24 W Figueroa St, Santa Barbara, CA 93101. The Honey B offers a large variety of vegan options, and has amazing views of the entire city, since it is situated on the rooftop of Antioch University. If you are looking for a delicious, savory breakfast, try the Isabel, which is a breakfast burrito stuffed with tofu scramble, sweet potato, avocado creama, arugula, black beans, and walnut pesto. For lunch, try one of the “Bee Bowls” like the curry bowl or the superfood bowl. If you aren’t that hungry, you are able to get a half size, too. If you prefer to make your own “superfood” bowl at home, try making this Roasted Buddha Bowl! The Honey is located at 602 Anacapa St, Santa Barbara, CA 93101. Hana Kitchen is an Asian fusion restaurant located in downtown Santa Barbara, as well as in Isla Vista, California, near the University of California, Santa Barbara campus. They offer delicious bowls, tacos, and teas. Try the vegan bowl with brown rice, which is soy based chicken, and their famous, homemade teriyaki sauce. You could also order any of the tacos, but substitute with vegan meat. You are able to order online, as well as have your meal delivered, which is perfect if you feel like just having a night in! If you can’t make it to Hana Kitchen, but are craving tacos, try making these Chili Lime Lentil Tacos With Spicy Grilled Pineapple Salsa . They are open until 3:00 AM on the weekends, and until 1:00 AM the other days of the week, which makes it convenient for those who are looking for late night grub! You can find Hana Kitchen at 6558 Pardall Rd, Goleta, CA 93117, as well as 503 State St, Santa Barbara, CA 93101. If you just feel like relaxing and enjoying a burger with fries, you will want to try the vegan options at Mesa Burger, which is located on the mesa. You can substitute the veggie patty for any of the burgers, or try the shoreline burger, which is the veggie patty stacked with red pepper hummus, pickled red onions, sprouts, and salsa verde. You could also try the veggie patty in a lettuce wrap or gluten free bun. Try ordering with their signature fries, or the sweet potato waffle fries! If you can’t make it to Mesa Burger, find a veggie burger inspiration from this article on 10 Epic Veggie Burgers to Thrown on the Grill Now. Mesa Burger is located on the Santa Barbara mesa, at 315 Meigs Rd, Santa Barbara, CA 93109. Although this restaurant is by no means all plant-based, they have some great options, which is great if you plan to visit Hoffman Brat Haus. Three vegan brats are offered, using the brand Fieldroast. You could try the vegetarian fresh Italian brat, the vegetarian smoked chipotle brat, or the vegetarian sweet apple brat. Try some of the vegan toppings like; raw sauerkraut, caramelized onions, sweet peppers, and spicy peppers. For sides, you could get fries or a soft pretzel, both of which are vegan! To make your own vegan sausage, try out this recipe for Homemade Spicy Italian Sausage. This restaurant also has live music every Thursday and Sunday from 7:00 PM until 9:00 PM if you feel like sitting back and listening to some local musicians, and trivia every first Monday of the month at the same time. This restaurant is located downtown, at 801 State St, Santa Barbara, CA 93101. Shang Hai is a Chinese food restaurant with an extensive vegetarian menu, located in a shopping center on Milpas, a few miles from downtown. Serving up veggies, tofu, and vegan meat, you will have many options to choose from at this hidden gem. Try the lemon soybean chicken, or the Mongolian soybean beef. If you are torn between a few different options, try ordering a few appetizers like the fried tofu, fried soybean chicken, and vegetarian pu-pu tray. If you can’t make it to Shang Hai, you could also try making these Crispy Tofu Nuggets. The restaurant is closed on Tuesdays, so be sure you plan your visit on a different day of the week. It is located at 830 N Milpas St, Santa Barbara, CA 93103. Although not technically a restaurant, the grocery store, Lazy Acres, is the perfect place to shop if you want to stay home and cook dinner yourself, or if you feel like picking up a house made vegan salads or juices. Rice milk and soy milk are offered at the juice bar if you are in the mood for a refreshing smoothie, and there are a variety of vegan salads on the salad bar daily. If you feel like something sweet, check out the bakery section which has an abundance of vegan items available. If you want to make your own juice instead of buying one, check out these 7 Delicious Juice Recipes! Lazy Acres is located on the mesa, and is open until 11:00 PM everyday except for Sunday when they close at 10:00 PM, and is located at 302 Meigs Rd, Santa Barbara, CA 93109. Nothing beats waking up and going to the farmers market on a warm Saturday morning. Strawberries, oranges, tomatoes, and peppers are just a few of the produce options available when browsing the Santa Barbara Farmers market. Purchasing items from farmers markets are a great way to support local businesses and try different fruits and vegetables that may not always be available at the grocery store. After buying all your fruits and vegetables, you could try juicing them and checking out this article on 5 Fruit and Vegetable Juices. This farmers market is set up in downtown Santa Barbara on Saturdays and Tuesdays, Goleta on Sundays, Solvang on Wednesdays, Carpinteria on Thursdays, and Montecito on Fridays. Check it out! Feel like just staying in and cooking at home? Try out some of these delicious recipes!